We both work at Salem College, a small women’s college in North Carolina that serves a diverse student population. There is currently no explicitly scaffolded writing component for students; therefore our work as instructors of research and writing skills often happens on an as-needed basis. Katie is the Director of the Writing Center and an Assistant Professor of English. She is a white, middle class, able bodied, fat, queer cisgender woman. Anna is the Discovery and Delivery Librarian. She is a white, middle class, able-bodied, straight cisgender woman. We created the workshop “What is (Your) Truth? 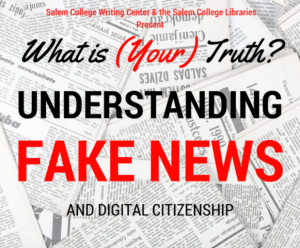 Understanding Fake News and Digital Citizenship” in response to a meeting for faculty about teaching and addressing politics in the classroom, post-election. 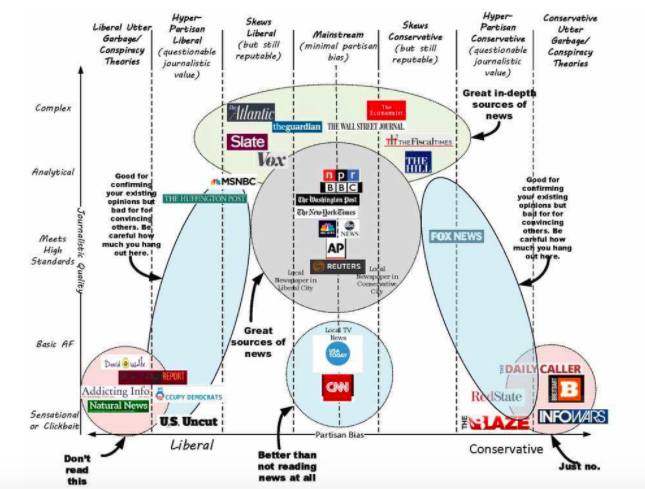 As a way to talk about politics indirectly, faculty voiced a need for discussions and tools about understanding source credibility in both formal and informal spaces, including classrooms and social media. 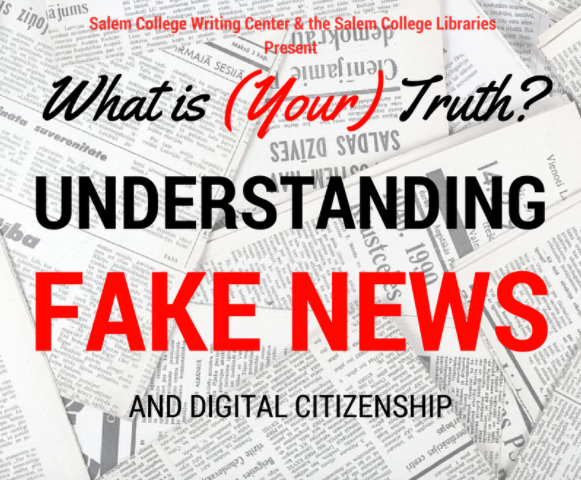 In reaction to these discussions, the Salem College Writing Center and Salem College Libraries, with help from the Office for Diversity and Inclusiveness collaborated to create this workshop. This collaboration is in line with our feminist rhetorical orientation to teaching engaged citizens (Pough, Yancy). 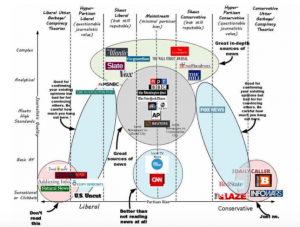 We chose to use identity and positionality as key concepts to understanding what constitutes “fake” news. The workshop focuses on a nuanced approach to seeing how perspective and bias affects everything that we see. The goal of this workshop is to think about politics without being overtly political. We want participants to question their assumptions based on their own positionality, and to question their sources. To this end, we relied on four elements – Authority Is Constructed and Contextual, Information Creation as a Process, Information Has Value, and Research As Inquiry – from the Framework for Information Literacy for Higher Education (which endorses metaliteracy, knowledge practices, and learner dispositions to create six conceptual frames that undergird the praxis of information literacy) to inform our workshop design (2). The first activity is to define all of our terms as a group. We asked students to reflect on what “news” was to them (asking what they read, where they went to find it, and if they paid for it) and what the concept of “digital citizenship” meant to them. With some group u nderstanding of multiple outlets for information (Facebook has been a constant in our workshops) and the responsibility of sharing credible information online, (as well as a brief discussion of the relevance of the quote from Lincoln, shown here) we moved to the second activity. The second activity focuses on understanding personal perspective by examining an object. This activity is adapted from an assignment from Michigan State University’s first year writing curriculum, the “Cultural Artifact Analysis” assignment, and focused on a brainstorming activity where students were asked to explain the first thing that came to mind when they saw an object. This is in line with notions of metaliteracy, which “expands the scope of traditional information skills (determine, access, locate, understand, produce, and use information) to include the collaborative production and sharing of information in participatory digital environments (collaborate, participate, produce, and share)” (1). For our specific audience of students at a women’s college, we chose Anna’s wedding ring as our object for inquiry. In this exercise, participants received no context about the ring and were encouraged to question its origin, material composition, social context, ownership, and more. Using a short writing exercise along with small group discussion, participants employed metacognition to identify and acknowledge their own experience and biases related to the ring – including the meaning they constructed from it. During the discussion, Katie would take a stance that was often at odds with popular opinion of the object. She would reveal that she was a queer woman who strives to practice “relationship anarchy,” and as a result of her positionality, she saw the object as a symbol of oppression and global consumer capitalism. Anna, as the owner of the object, shared the known origins of the ring – a family heirloom, passed down from her grandmother and a symbol of family love and commitment through marriage to her husband. We end the activity by emphasizing that while both interpretations of the object were valid (as were all student responses, which usually fell in between these two positions), ultimately Anna’s meaning couldn’t be known unless we asked her. We transitioned to the next activity by asking students to reflect on how their positionality (race, class, gender, orientation, size, able-bodiedness, etc.) affected their associations with the ring, and with the information that they chose to consume. The third part of the workshop focuses on information situation and evaluation. We chose not to focus the workshop around “sensational” news, although that often comes up in discussions. Instead, we chose two news sources that dealt with the same piece of research to show multiple sides and interpretations of an issue: a recent USDA report on food consumption by SNAP households. While not overtly political, the issue, and the way the two pieces discuss it, raises conversations around class and size. We read both pieces aloud as a group. The first piece was “In the Shopping Cart of a Food Stamp Household: Lots of Soda” – from the New York Times and the second – “In the Shopping Cart of a Food Stamp Household: Not What the New York Times Reported” – from Talk Poverty. After reading them together, we applied the idea of PAARC (Purpose, Authority, Accuracy, Relevance, and Currency) and discussed how each piece was written from a different position. We shared the image of the bell curve of sources and talked about bias and ethics in reporting and sharing information. The fourth and final part of the workshop focused on student production and reflection. We asked the students to produce their own piece of “fake news”–an advertisement for the workshop that sold it as the best workshop ever (which we plan to use in the future for advertising the workshop, with the caveat that these statements might be false). We talked about the ethics of over-selling a workshop on ethics and fake news. After we shared advertisements we used the discussion to create a shared accountability statement for working with information. The ongoing draft of this can be seen on the final slide of the workshop. Currently, we have given the workshop once on campus and have plans to do it at least twice more this semester. Participation was voluntary, and we had mostly upper level students attend our first workshop. While the participant response to the workshop has been very positive, we felt that 90 minutes was not enough to delve deep into issues of identity, especially if the workshop involves many students. We encourage others to use this workshop as a starting point for further conversation and collaboration, and to let us know how it works at other institutions. Mackey, Thomas P., and Trudi E. Jacobson. Metaliteracy: Reinventing Information Literacy to Empower Learners. Neal-Schuman, 2014. Pough, Gwendolyn D. “2011 CCCC Chair’s Address: It’s Bigger than Comp/Rhet: Contested and Undisciplined.” College Composition and Communication 63.2 (2011): 301–313. Print. Yancey, Kathleen Blake. Writing in the 21st Century. Urbana, IL: National Council of Teachers of English, 2009. Print. Anna is the Discovery and Delivery Librarian at Salem College. Katie Manthey is an assistant professor of English and director of the writing center at Salem College. Her research and teaching are focused around cultural rhetorics, fat studies, dress studies, and civic engagement. These are such wonderful posts about how to teach post-election! I’m writing a paper on feminist pedagogy in the era of Trump, and this has been very useful. Thanks so much!